Соглашение о порядке взаимодействия между Министерством лесного хозяйства... 1 76.92kb. Сведения о новых фондах, поступивших на хранение в гу «цга ур» в... 1 107.64kb. «День сельского хозяйства в кругу друзей» 1 106.04kb. Два новых замминистра сельского хозяйства. Кто они? 1 15.92kb. Программа Малых Грантов (пмг) Глобального Экологического фонда (гэф) 1 377.51kb. Программа вступительного экзамена 1 179.75kb. Рейтинг элиты Оренбургской области 1 117.52kb. История развития бюджетного учреждения Чувашской Республики «Чувашская... 1 127.63kb. Программа в сероссийской научно-практической конференции 1 70.91kb. В сф предлагают использовать американский опыт поддержки сельского... 1 30.38kb. Министерство сельского хозяйства пензенской области управление рынка... 13 8206.28kb. Нардид А. В., Иванова Н. И., Кутровский В. Н. Московский ниисх «Немчиновка» 1 186.71kb. Материалы международной конференции с элементами научной школы для молодежи «ЕС – Россия: 7-я Рамочная программа в области биотехнологии, сельского, лесного, рыбного хозяйства и пищи» в рамках Федеральной целевой программы «Научные и научно-педагогические кадры инновационной России» на 2009-2013 годы (29 сентября - 5 октября 2010 г. ).– Уфа: Изд-во БГАУ, 2010.– 390 с.
Ответственный за выпуск: Янбаев Ю.А. – заведующий научно-образовательного центра Башкирского ГАУ, доктор биологических наук. В сборнике опубликованы доклады выступлений участников международной научно-практической конференции в рамках Федеральной целевой программы «Научные и научно-педагогические кадры инновационной России». Материалы сборника посвящены актуальным проблемам научных исследований в области биотехнологии, лесного, рыбного хозяйства и пищи. Для эффективного освоения молодыми исследователями и преподавателями лучших научных и методических отечественных и мировых достижений в рамках Федеральной целевой программы «Научные и научно-педагогические кадры инновационной России» на 2009-2013 годы» ежегодно проводится отбор около 100 проектов по проведению всероссийских и международных молодежных научных конференций и школ с привлечением известных российских и зарубежных ученых. Приказом Федерального агентства по науке и инновациям от «19» февраля 2010 г. № 21 объявлено о проведении открытого конкурса на право заключения государственных контрактов на выполнение работ для государственных нужд в рамках федеральной целевой программы «Научные и научно-педагогические кадры инновационной России» на 2009-2013 годы (мероприятие 2.1 - III очередь) по теме «Организационно-техническое обеспечение проведения международной конференции с элементами научной школы для молодежи «ЕС – Россия: 7-я Рамочная программа в области биотехнологии, сельского, лесного, рыбного хозяйства и пищи». В результате проведения конкурса право на заключение Госконтракта получило ФГОУ ВПО «Башкирский государственный аграрный университет» (№ 02.741.11.2233. от 11 мая 2010 г. Шифр «2010-2.1-101-078-001»). В настоящем сборнике, выпущенном при финансовой поддержке Министерства образования и науки Российской Федерации в рамках Федеральной целевой программы «Научные и научно-педагогические кадры инновационной России» на 2009-2013 годы», опубликованы материалы, доложенные участниками на данной Конференции. The federal political structure in Germany is also reflected in the arrangement of German research landscape. Universities are under the administration of the single federal states, whereas some federal ministries have their own research organisations. In addition, some research organisations exist with an admixture of federal and single state financing, as the Leibniz Association or Max Planck Society. The Federal Ministry of Food, Agriculture and Consumer Protection (BMELV) has four research institutions that work in the field of agricultural research in the broadest sense: the Johann Heinrich von Thünen-Institute (Federal Research Institute for Rural Areas, Forestry and Fisheries), the Julius Kühn-Institute (Federal Research Institute for Cultivated Plants), the Friedrich Loeffler-Institute (Federal Research Institute for Animal Health) and the Max Rubner-Institute (Federal Research Institute for Nutrition and Food). These federal institutes are integrated into many international research projects, especially within the European Community (EC), but also with numerous third party countries. Because of the rapid development of Russia in science and technology in the last decade and because of several official international agreements, Russia became an important Science & Technology partner for Germany and the most successful third-country partner in the 6th Framework Programme of the EC. The current 7th Framework Programme of the EC covers the period from 2007-2013. Once a year, the EC announces a “Work Programme” with thematic research topics concerning Food, Agriculture, Fisheries and Biotechnology. One important source of released call topics are the recommendations deriving from several relevant European Technology Platforms, e.g. “Plants for the future”, “Food for life”, “Organics”, “Forest Based Sector”, “Aquaculture”, and “Global Animal Health”. A network of Russian National Contact Points (www.fp7-bio.ru/en/biotech/russian-ncps/) and Regional Information Centres (www.fp7-bio.ru/en/biotech/regional-info-centres/) on different thematic priorities of the 7th Framework Programme of the EC was established in Russia in the last few years. Examples of such Russian consulting agencies experienced in establishing co-operations are the Russian National Contact Point „Biotechnology, Agriculture, Forestry, Fisheries & Aquaculture and Food” at the A. N. Bach Institute of Biochemistry in Moscow (www.fp7-bio.ru) and the Regional Information Centre for Scientific and Technological Cooperation with the EC at the State University Voronezh (www.ric.vsu.ru). The local representatives at the Voronezh University, Dr. Igor Zornikov and Dr. Alla Akoulshina, have published a very helpful guidebook with detailed and useful information for potential Russian FP7 participants in the Russian language. However, due to some political, thematic and administrative issues, the Russian association with the EC Framework Programmes is not yet decided at the present time. Independent from EC association negotiations, bilateral German-Russian cooperation offers the opportunity to work together on scientific questions of interest for these two countries. The Agreement on Science & Technology cooperation between Germany and USSR from 1987 was revived in 2009. This agreement opens possibilities for an exchange of scientists between cooperating institutes of both countries, but without funding of scientific projects. An example for realization of this agreement is the cooperation between the vTI – Institute of Forest Genetics in Germany and the Department of Forestry of the Bashkir State Agricultural University. A “Strategic German-Russian Partnership in Education, Research and Innovation” was declared in 2005 (www.deutsch-russische-partnerschaft.de). It was followed by a number of specialized ongoing bilateral cooperation agreements, e. g. environmental protection, rational use of natural resources; biology / biotechnology, and marine / polar research. The German-Russian initiative „Dialogue on Science for Sustainability“ was started in 2008 and is now in progress between the Russian Ministry of Education and Science (MON) and the Federal Ministry of Education and Research (BMBF). Furthermore BMBF runs the Framework Programme „Research for sustainable development“ (www.fona.de/). One of the target countries for international tenders within this programme is Russia (since 2010). Similar scientific profiles of the Bashkir State Agricultural University and the Federal Research Institute for Rural Areas, Forestry and Fisheries - vTI and other Federal Research Institutes open possibilities for more intensive cooperation in the future. Forest genetics, population genetics, molecular markers, data types, software tools. Генетика леса, генетика населения, молекулярные маркеры, типы данных, инструменты программного обеспечения. Genetics is seen as a part of biological sciences with a rapidly increasing importance in basic research for insights into the function of life. Basic research in genetics is often carried out with model organisms like Escherichia coli (bacteria), Saccharomyces cerevisiae and Schizosaccharomyces pombe (yeasts), or Arabidopsis thaliana (plant, Brassicaceae). We find the practical application of genetic knowledge in the field of medicine and pharmacy, in breeding efforts for plants, animals and microorganisms, in biotechnological processes and in the development of funded strategies for biodiversity preservation and management. Forest genetics deals with complex, long-living organisms, their genetic variation in space and time, their evolutionary and adaptation processes, and their management and breeding. The practical interest in forestry is targeted on phenotypical traits, i.e., growth performance, resistance against biotic and abiotic factors or wood quality. These phenotypical traits are the result of multifaceted interactions of environmental factors on the one hand and genotypes at the individual and population level on the other hand. Phenotypical traits and environmental factors are often characterized by numerical data, but also by ordinal or nominal data, and can be evaluated by standard statistic software packages. In contrast, the characterization of genotypes is carried out with so-called genetic markers. Genetic markers are defined as a certain location on a chromosome (gene locus, site), they were identified by a laboratory method with reproducible results, and they might be characterised by different variants within and among individuals and populations (polymorphisms, alleles, genotypes). Genetic data are mostly nominal data (names of alleles or genotypes), binary data (presence or absence of a genetic variant) or DNA sequence data (long strings of A, C, G and T). The mode of inheritance of genetic markers is different in dependence of the localization within the cell: Markers from the cell nucleus are inherited biparental (one half from mother and father each), mitochondrial markers are inherited by mother only, and chloroplast markers are inherited by mother in Angiosperms (broad-leaved trees) and by father in Gymnosperms (conifers). Examples for commonly used biparental inherited markers in population genetic studies are isozymes and nuclear microsatellites (DNA). The development of SNP markers (Single Nucleotide Polymorphisms) is ongoing and these markers will be applied in the future. Additionally, chloroplast DNA haplotypes and sometimes mitochondrial DNA haplotypes were used as uniparental inherited markers. Further molecular markers are RAPDs (Random Amplified Polymorphic DNA), AFLPs (Amplified Fragment Length Polymorphisms) and ISSRs (Inter Simple Sequence Repeats) with an undefined mode of inheritance, because they include DNA of the cell nucleus, of organelles like chloroplasts and mitochondria, and of endophytes (always present microorganisms within plant tissues). It is always an advantage to use markers with a defined mode of inheritance. to differentiate between closely related species, to identify hybrids or to check the clonal identity of breeding material and the correctness of controlled pollinations. Biparental inherited markers show higher variations on the small scale (individual and population level) and uniparental inherited markers tend to have more variation on large scales (regions or distribution areas). These patterns could give a first orientation to choose a suitable marker type for a certain purpose or question. Furthermore, the number of available loci and their variation for the respective species and technical aspects were incorporated into the decision on markers. Starting from nominal data, many different parameters were used to quantify the genetic variation within populations (i. e., allele frequencies, heterozygosity or diversity) or among populations (i. e., differentiation, genetic distances). In addition, more complex data evaluation is possible for the arrangement of individuals or populations (i. e., cluster analysis or other multivariate methods). Binary data were used to calculate similarity coefficients for pairwise comparison of samples (i. e., DICE or JACCARD coefficients) to construct dendrograms. The first step to compare DNA sequence data of several samples is a multiple sequence alignment. Thus, regions of identical DNA sequences, mismatches and gaps were visible. For quantification of genetic variation the nucleotide diversity can be calculated with regard to different weights for matches and gaps. Variation among samples or their relatedness can be visualised in dendrograms. The evaluation of genetic data needs special software packages developed for such special data types. Most of them are freely available and can be downloaded from several websites (i. e., http://molbiol-tools.ca/molecular_biology_freeware.htm; http://courses.washington. edu/fish543/Software.htm). All published DNA sequences are available in Genbank (http://www.ncbi.nlm.nih.gov/genbank/). This database is updated daily and offers many software tools especially for DNA sequence data analysis. The development of molecular markers, new laboratory techniques and the associated development of databases and software tools are always in progress and will open potentials for new knowledge. What were the major causes? Do the problems continue today? What are the perspectives for the future? he following figure (Figure 1) shows what happened in 2007/2008. World price of corn, wheat and rice increased drastically. One of the reasons was the oil price spike. This figure (Figure 2) gives a survey of the major causes. irst, we look at the international food markets (on the right of the graph). Incomes rose considerably in the world, particularly in threshold countries like China, Mexico, Brasil…In countries like China, a new middle class emerged and grew rapidly. The result was a fast growing demand for food products on the world market. At the same time world supply of food products was reduced. Firstly, there had been crop failures worldwide, due to unfavourable weather conditions. Secondly, more and more agricultural land was diverted from the production of foodstuffs to cultures for the production of biofuels. As a result of all these developments, food prices rose sharply. Another very important reason was the depreciation of the dollar. Journalists and left-wing politicians often claim that another cause was the speculation with food products, but so far I have not found a proof of this contention. Let us now look at the international market for energy (on the left side of the graph). Here, demand also rose considerably, in particular in threshold countries like China. Why? Because there, increased production of industrial and other goods required a lot of additional energy like oil. Furthermore, the rising incomes led to additional purchase of consumer goods. Their use also requires energy – just think of washing machines, car, radiators, microwaves or computers. The increased availability of biofuel does not seem to have compensated this factor. In any case, energy prices rose sharply. Another reason was the depreciation of the dollar. I do not know whether speculation in energy also played a role, as has been claimed by many journalists and politicians. Unfortunately, there is a close link between energy prices and food prices. Agricultural production consumes a lot of energy. Just think of tractors or combine harvesters. And the energy content of fertiliser is very high. No wonder that food prices were also driven up from that side. or the poor people in the world the food crisis had two aspects. Firstly, higher energy prices reduced the purchasing power of their budgets. Secondly, the higher food prices also meant that they could not buy the food they needed to survive. Let us make a brief theoretical digression to explain two aspects of this development. Firstly, the sharp food price rises were largely due to the inelastic demand curves of the basic food products. This is shown in the next graph [Figure 3]. Here, the increase in demand and the reduction of supply lead to a reduction of food quantity by 20% but to a rise of food price by 500 percent! 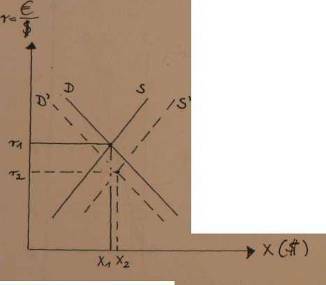 Figure 4 The dollar demand and supply interaction. Secondly, the depreciation of the dollar was due to several causes. The next graph (Figure 4) shows it in a simplified way. Here the US’ unfavourable balance of trade is one factor. Furthermore, the US became less attractive for other nations’ capital exports. Thirdly, there was speculation against the dollar. Reactions of developing and threshold ountries. The rise in food prices was a shock to all those countries where a large part of the population is very poor. No wonder that they did all they could to prevent domestic food prices from rising. Many food importing countries subsidized the food imports or introduced ceiling food prices. Food exporting countries introduced export taxes or export bans. All these helped to keep down food prices. On the other hand, as a consequence, world food prices rose ever further. This is shown by the following Figure 5. Country A, on the left, is an exporting country. To get down domestic price, it introduces an export tax. The fall of internal product price is beneficial to its poor consumers. But it is harmful to domestic agriculture. At the same time, it raises world price and the domestic prices in the rest of the world. It is a typical “beggar-my-neigbour” policy. Since the middle of 2008, the following developments have taken place. 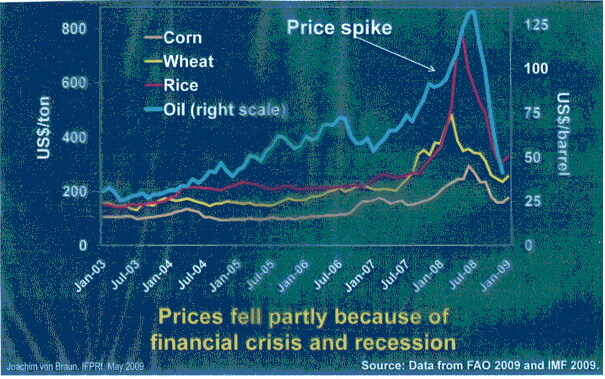 p to the end of 2008, food prices fell rapidly (Figure 6). But they were still higher than in the year 2007. One of the main reasons was the world financial crisis and recession, which had two effects. Firstly, less world demand for food products fell. Secondly: less demand for energy and a corresponding fall in energy price and food production cost. Another reason was record harvest of basic cereals, and an appreciation of the dollar. After 2009, world food prices seem to have stagnated or slightly increased again. In particular, the price of corn has risen. In developing countries, especially those of sub-Saharan Africa, international food prices are still relatively high. Oil price has risen again. What will happen in the future? Let’s see the major determinants. The weather. It’s the most important factor, however technical progress in agriculture (e.g. irrigation) will reduce the dependence on the weather. Food aid. Fortunately, we already have the UN world food program and other food aid programs; the idea is to step then up if needed. World cereal reserve (“bufferstock”). The countries of G8 have declared to establish world cereal reserves. Each country is to store a certain amount of cereals. If needed, it will be sold on the world market to drive down food prices. Unfortunately, it takes time to translate this declaration into reality. Export taxes and import subsidies, they have already partly been reduced. Long run factors. These seem to be more important. Word demand develops. The world recession has already partly been overcome, and economists are optimistic that enough international measures have been taken to prevent a new one. If this is realistic, world demand for products will, in the long-run, go on rising significantly, in particular in the threshold countries. World supply of food products: how will it develop? In particular: What about the future productions of biofuels? Additional agricultural development projects and additional agricultural research: to what extent can they help? International agricultural research will have to create a second “great revolution”. However, plant breeding and green genetic engineering will no longer aim to increase yields, but to raise resistance against heat, drought and flooding; and to develop sorts that can even grow on land with a high degree of salinization. Protectionism of the developed countries: will it be reduced? I.e. will the developed countries give the other countries a chance to develop their own agricultural potential? Dollar exchange rate develops: nobody can predict its future behavior. To sum up: even if food prices have fallen after the peak of the world food crisis, food price interaction persists. In the long run it will no doubt continue, until its underlying causes have been removed; principally, the inelasticity of agricultural productivity to keep pace with burgeoning demand, in particular in the threshold countries. Major factors sharpening the world food crisis are: globalization; growing demand for wheat in threshold countries; growing incomes of the population in these countries; poor harvests; use of agricultural crops for biofuel manufacture; the depreciation of the dollar exchange rate; a growing imbalance between world supply and demand for foodstuffs, energy and the prices for foodstuff and energy carriers. The world food crisis began about two years ago. It was widely discussed on television and many articles were written in newspapers and magazines. In the meanwhile, journalists have lost interest in this topic, but the food crisis continues. We can roughly classify the countries of the world as developed, developing or threshold (emerging) countries. The economic situation in developing and threshold countries has exerted a great influence on the emergence of the world food crisis. Within the last two centuries the real world price of wheat gradually decreased. From 1872 to 2007, it decreased on average from 800 - 600 to 200 - 150 dollars per ton. Certainly, during this period, there were cases of sudden rises and falls in the price of wheat. In the last few years the price of wheat has begun to rise, so its level has reached 250 dollars per ton in 2007 and 330-350 dollars in 2010. At the same time world population increased, rising from about 2 billion in 1872 to more than 6 billion in 2007. Thus, the basic tendency of the fall in the wheat market price was accompanied by a growth of world population and accordingly of the world requirements of wheat. Given the growth of world population and the increase in the requirements of wheat, the price for this product would be expected to rise. But up to 2007 it tended to decrease. The tendency of falling price was caused by two factors, namely supply and poverty. Firstly, repeated increase in the production of wheat all over the world and accordingly wheat supply growth in the market of agricultural production contributed to wheat price fall tendencies. Secondly, as a growing part of the population did not have the income to purchase the food they needed, they did not have the corresponding effective (market) demand. Thus effective demand grew at a slower rate than supply. In the world the majority of people have no sufficient financial resources, for the purchase of necessary quantity of food products. This results in wheat supply being larger than demand, and as a consequence there is a reduction of market price. But last years the situation in the market of agricultural production – including the wheat market - has changed. The prices for agricultural production and wheat have started to rise. What is the reason of that growth? Let us consider the interrelation between globalization and the food crisis. We developed a scheme which gives a general idea about major determinants of the world food crisis (see figure 1). Globalization means an increased mobility of goods, capital, ideas, and people. Some gain from it while others lose. The countries which have entered into this process recently (for example, China) have clearly gained. When the threshold countries enter these new economic relations, new commodity import markets of foodstuffs open up for them, world demand for foodstuffs and as consequence the price of wheat start to grow. This also causes the big difference between the level of inhabitants’ provision with foodstuff in developed, developing and threshold countries. Due to this fact the threshold countries understand the necessity to increase their per capita production of food products, and their governments actively start subsidizing the agrarian sector. In these countries we see the emergence of very rich and very poor groups of the population. For example, in China there is a clear increase of millionaires and of the number of poor people; there is also the emergence of a growing middle class. The growth of income of inhabitants in the threshold countries raises world demand for foodstuffs and leads to price growth (see figure 1). he rise in prices for the foodstuffs is also explained by speculation on the food market, but this factor has not yet been sufficiently studied, let alone proved by statistical data. Income growth of inhabitants in the threshold countries, their emergence on the import food markets, these factors lead to growth of world demand for foodstuffs, and as a consequence to a rise in prices. Thus the world food crisis, which is mainly characterized by the shortage and unavailability of food products, the growth of the demand for food and rising wheat prices, is going on. Another factor influencing the world food crisis is the production of biofuels. A part of agricultural products is now being used for the production of biofuels. For example in 2008 more than 30 % of corn harvest in the USA was used for biofuel manufacture. According to the estimate of various organizations, the future rise in prices on food will by the amount of 30% be caused by the demand for biofuel. Now more and more land resources are being used for the cultivation of crops for the production of biofuels. The regulations and subsidies introduced by various governments in the field of biofuel have resulted in the fact that the fruits of agriculture are less and less on the table of poor people but instead in the petrol tanks of the rich. The increase of the demand for agricultural products used for biofuel manufacture directly depends on world energy supply and demand and energy market prices. The influence of these factors is shown in figure 1. When energy prices grow, demand for agricultural crops used for the production of biofuel will also rise. Whether the speculation with energy (gasoline, oil, gas, electric power) has taken place, is not proved by the statistical data. That is why we added a question mark in the figure. At the same time, increase in food production has required additional energy. 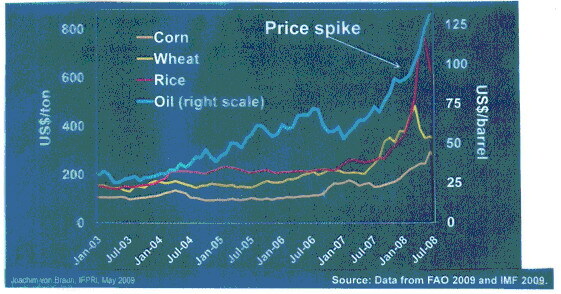 The higher energy prices have contributed to rising food production cost, which resulted in a further wheat price rise. The world supply of foodstuffs has also been reduced by droughts and poor harvests due to climatic factors. In bad years the wheat harvest volume goes down, as we have seen in Russia this year. Finally, these factors have also contributed to price increases. At the same time the world food and energy prices are also strongly influenced by changes in the dollar exchange rate. Thus the depreciation of the dollar has also lead to the rise of foodstuff prices. To sum up, major factors sharpening the world food crisis are: globalization; growing demand for wheat in threshold countries; growing incomes of the population in these countries; poor harvests; use of agricultural crops for biofuel manufacture; the depreciation of the dollar exchange rate; a growing imbalance between world supply and demand for foodstuffs, energy and the prices for foodstuff and energy carriers. Kovalenko N.A., the first deputy minister of agriculture of the Republic Bashkortostan. В настоящее время из-за негативного влияния погодных условий в летние периоды 2009 и 2010 годов, когда из-за засухи гибель сельскохозяйственных культур в эти годы составила большую часть посевных площадей, показатели сельскохозяйственного производства значительно снижены. В республике второй год подряд в соответствии с распоряжением Правительства был введен режим чрезвычайной ситуации. Существенное снижение продуктивности кормовой пашни и среднемноголетних значений по урожайности всех видов сельхозкультур (особенно зерновых) в текущем году поставили под угрозу сохранение поголовья скота, т.к. дефицит кормов по районам республики к концу лета составлял 10-12 ц к.ед. Были снижены показатели по поголовью и продуктивности. Ущерб сельскохозяйственных товаропроизводителей превысил 15 млрд. рублей, при этом только на проведение весенних полевых работ было потрачено около 5,5 млрд. рублей. По итогам восьми месяцев текущего года объем производства валовой сельскохозяйственной продукции составил 53 млрд. рублей. Это более чем на 20% ниже аналогичного уровня прошлого года, при этом по сельскохозяйственным организациям данный показатель снизился на 30,7%, по ЛПХ – на 15%, по КФХ – на 3,3%. Валовой сбор зерна по итогам 8 месяцев составил 692 тыс. тонн, что на 40% ниже, чем в аналогичном периоде прошлого года, реализовано скота и птицы на убой в живом весе 216 тыс. тонн (- 1,2%), произведено молока – 1 млн. 637 тыс. тонн (- 3,2%). По всем категориям хозяйств допущено снижение поголовья скота: КРС – на 5,3%, коров – на 5%, остальных видов сельскохозяйственных животных на 3,5-5,5%. Тем не менее, состояние отрасли было стабилизировано благодаря ряду мер, предпринятому Правительством Республики Башкортостан в начале лета, поэтому удалось не допустить масштабного забоя скота, особенно маточного поголовья. Из бюджета Республики Башкортостан оперативно и очень своевременно было выделено более 1,5 млрд. рублей на ликвидацию и преодоление последствий засухи. Эти средства были направлены на компенсацию убытков, закуп дополнительной кормоуборочной техники, заготовку и доставку кормов, в т.ч. из других регионов страны. Кроме этого, из федерального бюджета предоставлен кредит в размере около 3,1 млрд. рублей для обеспечения закупа кормов и проведения сезонных полевых работ под урожай 2011 года. В настоящее время Министерством ведется сбор документов на предоставление этих субсидий. Дальнейшие перспективы развития сельского хозяйства в республике мы оцениваем, как удовлетворительные. В настоящее время Министерством сельского хозяйства совместно с Аграрным университетом и другими научными учреждениями республики разрабатывается долгосрочная Стратегия развития агропромышленного комплекса, которая включает в себя цели и задачи, определяющие приоритеты по направлениям по обеспечению роста производства продукции и расширенного воспроизводства по отраслям: развитие семеноводства, мясного и молочного скотоводства, перерабатывающей промышленности, реализация действующей республиканской программы развития ЛПХ и комплексных пилотных семейных ферм. Для этого в республике имеются резервы и ресурсы. С начала реализация приоритетного национального проекта «Развитие АПК» с 2006 года, а затем Государственной программы развития сельского хозяйства на период 2008-2012 годов аграрный сектор экономики стал довольно привлекательным для инвесторов – на территории республики реализуется ряд крупных проектов в мясном и молочном скотоводстве, свиноводстве, птицеводстве и перерабатывающей промышленности. С 2006 по 2009 год наблюдался стабильный рост инвестиций в сельское хозяйство, а общий объем кредитования отрасли за первые два года реализации Государственной программы составил более 16,5 млрд. рублей. Конечно, по объективным причинам, имеются трудности в завершении реализации ряда объектов – это и засуха, и финансовый кризис, и рост цен на энергоносители с удорожанием строительства самих объектов. Но, тем не менее, введенные начальные мощности на таких крупных агропромышленных предприятиях, как птицефабрика им. М.Гафури, ООО СХП «Нерал-Матрикс», ООО «Забарив-Агро», агрофирме «Байрамгул», птицефабриках группы компаний «УПАГ», Белебеевском и Дюртюлинском молочных комбинатах и других, позволили создать дополнительно более 500 новых рабочих мест. Но только лишь создать рабочие места и привлечь туда квалифицированных специалистов недостаточно. Необходимо их закрепить, чтобы эти специалисты получили опыт работы. Для достижения этой цели в республике в отношении молодых специалистов аграрного профиля с прошлого года реализуется Указ Президента Республики Башкортостан (от 25 мая 2009 года № УП-263) «О мерах государственной поддержки кадрового потенциала АПК РБ». В рамках Указа на сегодняшний день 234 специалиста получают государственную поддержку в виде единовременного предоставления 100 тыс. рублей выпускнику ВУЗа, и 60 тыс. рублей – ССУЗа, а также надбавки к заработной плате 7 тыс. и 4 тыс. рублей, соответственно. Хочу отметить, что Аграрный университет вносит большой вклад в деле подготовки высококвалифицированных и востребованных на рынке труда кадров. Пользуясь случаем, хочу поблагодарить руководство Университета за содействие в решении вопросов кадрового обеспечения АПК и поздравить от имени Министерства сельского хозяйства республики Башкортостан с этой знаменательной датой – восьмидесятилетием. Выражаю надежду, что Министерство и университет и в дальнейшем продолжат общую работу, направленную на развитие отраслей сельского хозяйства и перерабатывающей промышленности, из этих стен выйдет немало достойных людей, которые внесут свою лепту в укрепление и процветание республики, тем самым еще больше прославив родной ВУЗ! Гусманов У.Г., д-р экон. наук, профсор, академик-секретарь Отделения биологических, медицинских и сельскохозяйственных наук АН РБ, академик АН РБ, член-корр. РАСХН. Gusmanov U.G., the Dr. of economic sciences, professional rubbish, the academician-secretary of Branch of biological, medical and agricultural sciences of AN RB, the academician of AN RB, a member-correspondent of Russian Academy of Agrarian Sciences. Во всем мире и во все времена стоит проблема обеспечения населения продовольствием, как инструмент политической, экономической и социальной стабильности общества. Страны, прошедшие ранее этап индустриального развития, своевременно признали, что покупка продовольствия за рубежом слишком опасна для национальной экономики, так как становится причиной хронической утечки капиталов и усиления зависимости от внешней конъюнктуры рынка, колебания цен, возможного сокращения объемов поставок по объективным причинам. И не случайно, США, Великобритания, Франция, Германия и другие страны потратили немало усилий для возрождения собственного сельского хозяйства, поддержки национальных агропроизводителей и стали самодостаточны, т.е. обеспечены продуктами питания собственного производства и располагают резервом для экспорта. Исходя из опыта развитых стран установлено также, что около ¾ прироста производства продукции достигается за счет внедрения результатов научных исследований в производство, т.е. инновации. Поэтому если ставить задачу увеличения производства продукции сельского хозяйства, то следует помнить, что достичь ее можно лишь на основе инновации. Вполне логично, что многие страны выход из кризисного состояния всегда начинали с развития сельского хозяйства. А почему? Да потому, что 1 % прироста продукции сельского хозяйства оживляет всю экономику на 2,3 % и 1 работник сельского хозяйства обеспечивает занятость 8 человек в других отраслях народного хозяйства. А это, в свою очередь, рост оплаты труда, сокращение безработицы, улучшение питания и удлинение продолжительности жизни людей. Давайте посмотрим на другую сторону проблемы развития сельского хозяйства на основе достижений науки – окупаемости затрат. Как известно, важным направлением увеличения производства продукции является селекция и семеноводство сельскохозяйственных культур. Какова же окупаемость затрат в этой сфере? Каждый рубль вложений на селекцию и семеноводство приносит 11 рублей дохода. И все это благодаря тому, что селекция и семеноводство – это прямой путь внедрения достижений научной мысли в практику, да еще и более чем с десятикратной эффективностью. Другое важное направление увеличения производства продукции сельского хозяйства – это применение удобрений и высокоэффективных средств защиты растений от вредителей и болезней, производимых на основе разработанных учеными технологий, регламентов и современных препаратов. Затраты на рубль средств химзащиты и удобрений оборачивается 5 рублями дохода. Есть и другая особенность научных разработок. Одни и те же научные результаты не остаются пригодными в течение очень продолжительного времени. Или они не дают того эффекта, что от них получали в первые годы, или меняются условия. Так, потери урожая из-за сорняков и вредителей растений (по данным ООН) остаются на уровне 30-35%, а по ключевым культурам и того выше: по зерновым культурам – 35%, сахарной свекле – 42%, подсолнечнику – 37%. Только по этим трем культурам при среднегодовом уровне их производства за 1986-1990 гг. и сложившимся реализационным ценам потери из-за сорняков и вредителей по Российской Федерации составили за один год 2,75 млрд. долл. США при курсе доллара к рублю 1:30. Сравним: доход России от переработки импортного отработанного ядерного топлива за 10 лет должен составить 20 млрд., а без учета затрат на уборку этих трех культур – 27,5 млрд. долл. США. Почему же низка эффективность применения средств защиты растений от сорняков и вредителей? Среди комплекса факторов следует выделить два, которые тесно связаны с фундаментальными исследованиями. Первый фактор – химические средства борьбы полностью не решили проблемы уничтожения сорняков и вредителей, хотя породили проблему загрязнения окружающей среды и угрозы всем живым организмам, в том числе и человеку. Задача науки (химиков и биологов) состоит в том, чтобы разработать принципиально новые экологически безопасные высокоэффективные химические средства и разработать приемы более эффективного их использования, т.е. технологий, дающих возможность многократно увеличить целевое использование ядохимикатов. Второй фактор – подход к интегрированному методу борьбы с сорняками и болезнями путем использования естественных биологических способов, а химические средства применять лишь как крайнее средство в условиях эпифитотий. Кроме того, комплексный метод в регулировании численности вредителей включает применение научно-обоснованного севооборота, регулирование количества удобрений и водного режима, сроков сева, использование природных врагов вредителей сельского хозяйства и др. Естественно, что переход к такой сложной сельскохозяйственной практике может быть обеспечен только с высокоорганизованной научной базой. Особо возрастает значимость научных разработок на современном этапе развития страны, когда изменилось состояние продовольственного обеспечения населения и появилась значительная зависимость от импорта. Ведь современное состояние продовольственной ситуации, сложившееся в стране, вызвано не только резким спадом производства продукции АПК, оно во многом осложняется снижением платежеспособного спроса на продукты питания, особенно животного происхождения, диспаритетом цен на промышленные средства производства и продукцию сельского хозяйства, значительным сокращением бюджетной поддержки сельских товаропроизводителей и ослаблением производственного потенциала АПК и разрушением социальной сферы села. Поэтому выход из сложившегося положения следует искать на путях интенсификации научных разработок, как самих аграрников, так и исследований смежных областей фундаментальных наук (биологии, генетики, физики, химии и т.д.). Известно, что интенсификация самих научных исследований сопровождается их существенным удорожанием и нельзя не заметить происходящую тенденцию в мире, а именно, только очень небольшое число государств (США, страны Западной Европы) в состоянии позволить себе крупномасштабные научные исследования. Усиливается разрыв между развитыми и развивающимся странами: небольшое число стран становится монополистами научных достижений, а значительная часть стран мира будет существовать за счет результатов исследований за рубежом и вполне понятна потеря этими странами своей научной безопасности. Данный вопрос имеет прямое отношение к перспективе развития сельского хозяйства страны: отрасль все больше становится наукоемкой и это определяет возрастание роли науки, а научные учреждения по причине слабого финансирования не могут выполнить соответствующую роль. Следует помнить, что невозможно делать ставку на наукоемкое производство без поддержки соответствующего уровня научных исследований и без обеспечения научной безопасности. Из сказанного напрашивается один весьма важный вывод: современное состояние науки будет предопределять будущий тип сельскохозяйственного производства. В настоящее время проблемы адаптации агросферы к глобальным изменениям климата стали предметом пристального внимания не только политиков, сельхозтоваропроизводителей и экономистов, но и всего населения планеты. Соответственно обеспечение продовольственной безопасности снова выдвигается на повестку дня всех государств мира независимо от уровня их экономического развития. Дело в том, что климатические изменения в разных континентах планеты, а также в отдельных регионах крупных стран носят неоднозначный характер и не обязательно, что они будут везде сопровождаться в будущем только общим потеплением. Наряду с этим, в полупустынных районах будет возрастать аридность климата, а в гумидных регионах – наблюдаться повышение, как общей температуры, так и количества осадков. Но при этом везде увеличивается дисперсия погодных аномалий в разрезе среднегодичных и сезонных величин, а также и на уровне отдельных декад в период активной вегетации растений. Вот этот фактор и является главным в негативных эффектах климатических изменений в регионе Южного Урала – Поволжья и в том числе и в Башкортостане, которые еще могут нарастать в ближайшие десятилетия, а затем, возможно, медленно затухать в последующие годы.